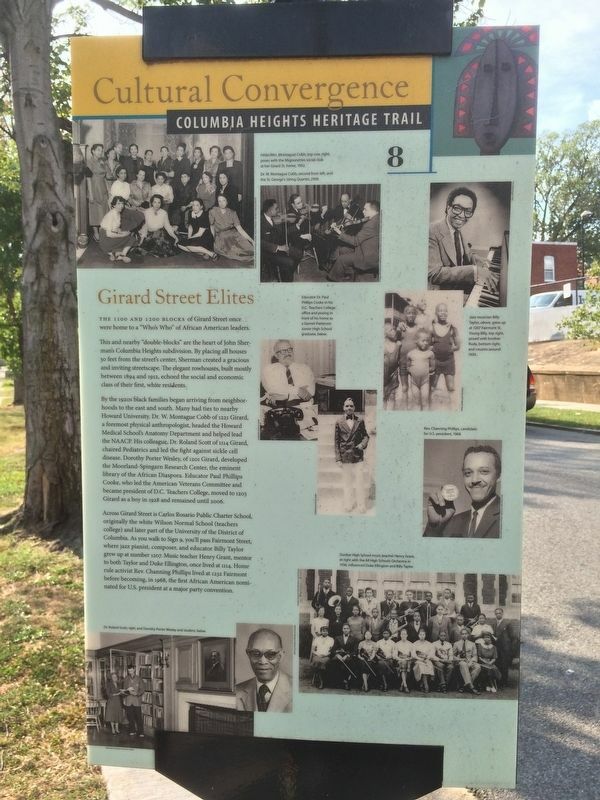 The 1100 and 1200 blocks of Girard Street once were home to a “Who’s Who” of African American leaders. 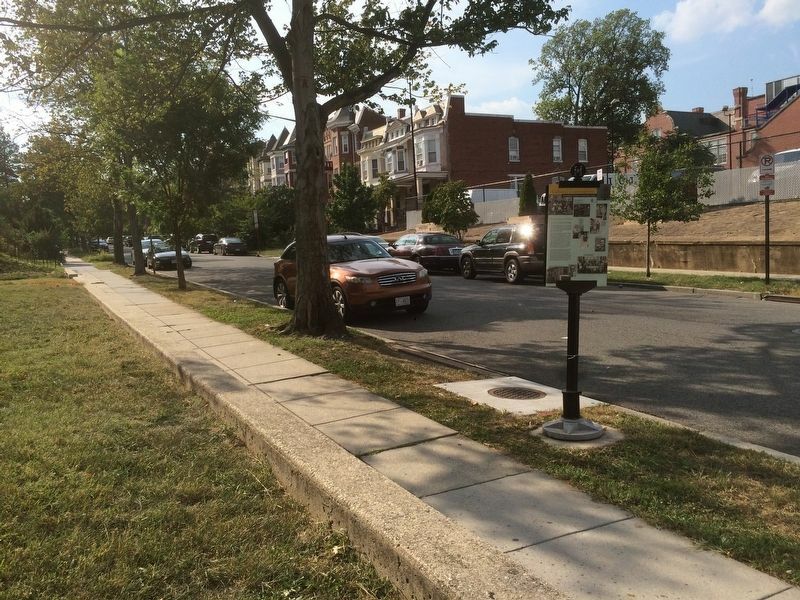 This and nearby “double-blocks” are the heart of John Sherman’s Columbia Heights subdivision. By placing all houses 30 feet from the street’s center, Sherman created a gracious and inviting streetscape. The elegant rowhouses, built mostly between 1894 and 1912, echoed the social and economic class of their first, white residents. Across Girard Street is Carlos Rosario Public Charter School, originally the white Wilson Normal School (teachers college) and later part of the University of the District of Columbia. As you walk to Sign 9, you’ll pass Fairmont Street, where jazz pianist, composer, and educator Billy Taylor grew up at 1207. Music teacher Henry Grant, mentor to both Taylor and Duke Ellington, once lived at 1114. Home rule activist Rev. Channing Phillips lived at 1232 Fairmont before becoming, in 1968, the first African American nominated for U.S. president at a major party convention. Dr. W. Montague Cobb, second from left, and the St. George’s String Quartet, 1939. Educator Dr. Paul Phillips Cooke in his D.C. Teachers College office and posing in front of his home as a Garnet-Patterson Junior High School graduate, below. Jazz musician Billy Taylor, above, grew up at 1207 Fairmont St. Young Billy, top right, posed with brother Rudy, bottom right, and cousins around 1930. Rev. Channing Phillips, candidate for U.S. president, 1968. Dunbar High School music teacher Henry Grant, at right with the All High Schools Orchestra in 1936, influenced Duke Ellington and Billy Taylor. This view of the marker is to the east along Girard Street, with 11th Street behind the photographer. Scott, right, and Dorothy Porter Wesley and student, below. 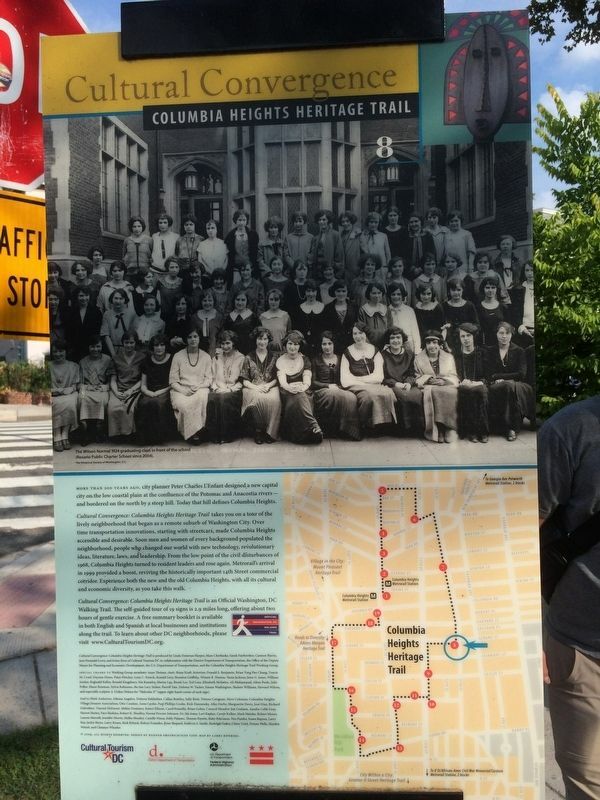 Cultural Convergence: Columbia Heights Heritage Trail takes you on a tour of the lively neighborhood that began as a remote suburb of Washington City. Over time, transportation innovations, starting with streetcars, made Columbia Heights accessible and desirable. Soon, men and women of every background populated the neighborhood, people who changed the world with new technology, revolutionary ideas, literature, laws, and leadership. From the low point of the civil disturbances of 1968, Columbia Heights turned to resident leaders and rose again. Metrorail’s arrival in 1999 provided a boost, reviving the historically important 14th Street commercial corridor. Experience both the new and old Columbia Heights, with all its cultural and economic diversity, as you talk this walk. Caption: The Wilson Normal 1924 graduating class in front of the school (Rosario Public Charter School since 2004). Location. 38° 55.55′ N, 77° 1.613′ W. Marker is in Columbia Heights, District of Columbia, in Washington. Marker is at the intersection of Girard Street Northwest and 11th Street Northwest, on the right when traveling west on Girard Street Northwest. Touch for map. Marker is in this post office area: Washington DC 20009, United States of America. Touch for directions. Other nearby markers. At least 8 other markers are within walking distance of this marker. "Treat Me Refined" (approx. 0.2 miles away); Urban Oasis (approx. 0.2 miles away); Justice vs. Injustice (approx. 0.2 miles away); Merriweather Home for Children (was approx. 0.2 miles away but has been reported missing. ); Along the "Nile Valley" (approx. 0.2 miles away); a different marker also named Along the "Nile Valley" (approx. 0.2 miles away); Beyond the Basics (approx. ¼ mile away); Francis L. Cardozo High School (approx. ¼ mile away). Touch for a list and map of all markers in Columbia Heights. More. Search the internet for Girard Street Elites. Credits. This page was last revised on March 14, 2019. This page originally submitted on September 13, 2016, by J. Makali Bruton of Querétaro, Mexico. This page has been viewed 192 times since then and 14 times this year. Last updated on March 7, 2019, by Devry Becker Jones of Washington, District of Columbia. Photos: 1, 2, 3. submitted on September 13, 2016, by J. Makali Bruton of Querétaro, Mexico.